Routen House offers gracious self catering holiday accommodation for up to twelve people. 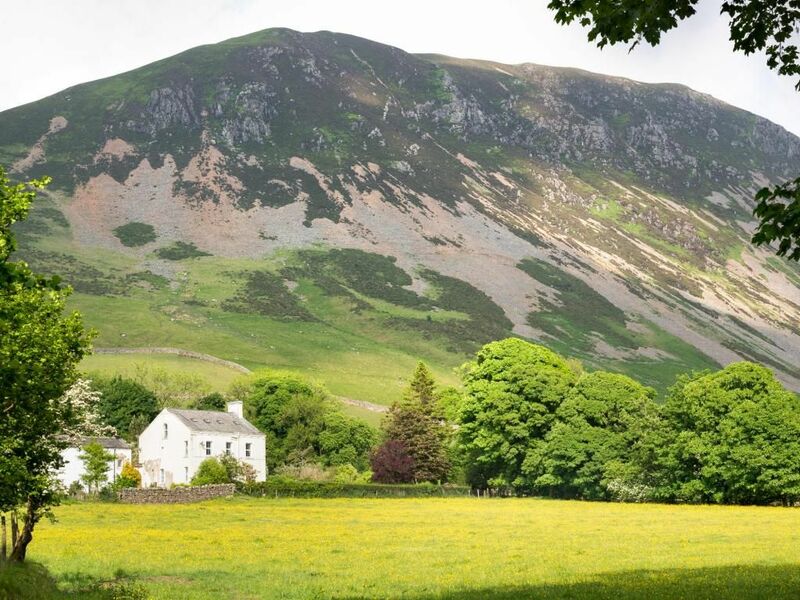 Originally a Victorian Country Farmhouse, it stands proudly near Ennerdale Water, one of the most spectacular and secluded lakes in the Lake District, Cumbria. The house itself has four acres of it's own land with pastures stretching towards the lake. In the garden there is a feeling of peace with panoramic views of the high fells and the lake. The separate paddock has a bubbling stream that commences its journey in the mountains and finally into the lake. Built more than 150 years ago, Routen House has been extensively refurbished and redecorated over the past few years. Spacious and sleeping 12 (plus cot) it is ideal for large family gatherings or for parties of walkers and friends. The large farmhouse kitchen is fitted with all the luxury of the 21st Century with microwave, fridge, electric oven, gas hob, dishwasher … there is even a bread maker if you fancy trying your hand at baking with minimal stress. Next door the utility room is the perfect place to leave muddy boots after a long walk. There is also a washing machine and tumble drier, as well as an extra fridge, freezer and separate toilet room. Beyond the kitchen is the dining room, furnished with antiques and a long table suitable for gracious dining as well as a quick takeaway from the nearby town of Cockermouth. There are two sitting rooms, both of which have recently been refurnished with new settees. The second lounge has patio windows which maximize on the superb uninterrupted views of the fells and countryside. The patio itself is the ideal place for barbecues or just to unwind with a drink after a hard day enjoying yourselves. Upstairs on the first floor there is one double room and three twin rooms, all sharing a family sized bathroom. For groups with families, kids love to take over this floor, leaving the adults to enjoy the second floor with its two en suite double rooms. The garden outside is ideal for children to play in. Pets are welcome and there is ample parking. Hello, I just wanted to give you some feedback. We absolutely loved our stay thank you. On arrival the house was immaculately clean, and very well stocked with everything we might need. We particularly appreciated the scullery/porch area that allowed storage of our outdoor stuff and the slate kitchen floor where we kept the dog. The layout of the house lent itself perfectly to the different needs and volume levels of 3generations. The location was fantastic allowing many different high and low level walks and bike rides that took us into and beyond Buttermere . The cinema in Workington and the pool in Whitehaven were great for the bad weather days and topped off by the community film in Lamplugh. Thank you particularly to the cleaners who had done such a great job and let us leave slightly more slowly on Sunday. Two things; we couldn’t get the hoover to work consistently and it’s cumbersome for the corners, and a pair of scissors would be great. Honestly, if that’s all I can think of to say negatively, you know you’ve got a great property. Thank you again, we really hope we can visit again. Thanks so much for your review and we're so glad that you enjoyed your stay at Routen House. It sounds like you certainly made the most of your visit and found lots of fabulous things to do. We look forward to hearing from you anytime again in the future. So glad that you had a lovely time at Routen House! Ennerdale is one of England's wildest valleys. It is one of the most remote lakes, offering a place to escape even in the high season. Yet it is only a 20 minute drive from a variety of towns and areas, some of which are listed below. Ennerdale lake is a deep glacial lake, 2.5 miles long, ¾ mile wide and 148 deep. The water is exceptionally clear and contains a variety of fish. It is the only lake that does not have a road running alongside it. Around Ennerdale, there are plenty of activities to keep you occupied. The nearest village, Ennerdale Bridge, has a Post Office and General Store, a church and two public houses (both serving good food and a variety of beers, including real ale). The market town of Cockermouth is a 20 minute drive away offering a variety of restaurants shops and supermarkets. Keswick is a 35 minute drive.